Keza Evelyne is a healthy young child. When you look at her, you wouldn’t guess that one month earlier she was struggling with severe malnutrition. Catholic Relief Services began working with Keza, her little sister and her mother, Nyiracumi, at the village nutrition school in their neighborhood in Mataba Village, Rwanda. It was a month after CRS began work on the Gikuriro program, which helps these schools teach parents how to cook healthy food and lower the risk of malnutrition for their children. Classes last for 12 days and focus on rehabilitating already malnourished children. 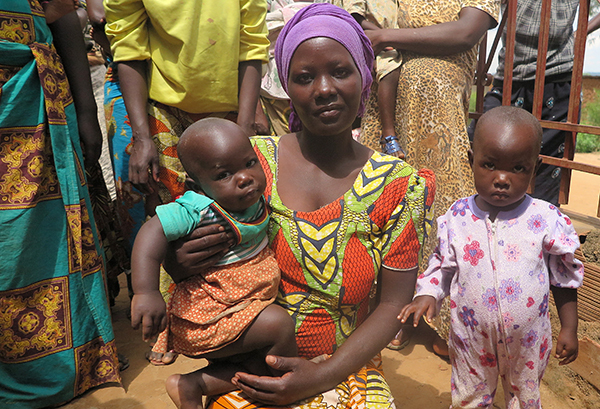 Mothers bring their children, age 5 and younger, who have signs of moderate malnutrition. Each mother also brings something to contribute to cooking a healthy meal: a variety of vegetables, small fish, fruits, beans, potatoes and eggs. This way, mothers learn how to cook healthy food using what’s available in their homes. “At the village nutrition school, we are not given any food. We are only asked to bring what we already have at home. They teach us how to cook and mix food well to make a healthy meal for our children,” says Nyiracumi. In fact, mixing different food groups together is one of many nutrition techniques taught at the school. When food is mixed together, children eat everything that is prepared without rejecting any nutritious food they do not like. Children also receive daily follow-up malnutrition screenings through the school. At the start, Nyiracumi did not believe food would cure Keza because she fed her regularly. Still, she was desperate to see Keza healthy, so she followed the school’s instructions. After the 12 days of her first class, Keza’s malnutrition rating improved from severe to moderate. After a second round of classes, Keza’s nutrition status was rated good. And Nyiracumi realized that being poor does not make malnutrition inevitable. Aimable and Nyiracumi are not the only ones happy about the Gikuriro program. Nyirahabimana Vestine is a mother learning at a village nutrition school in a different community. 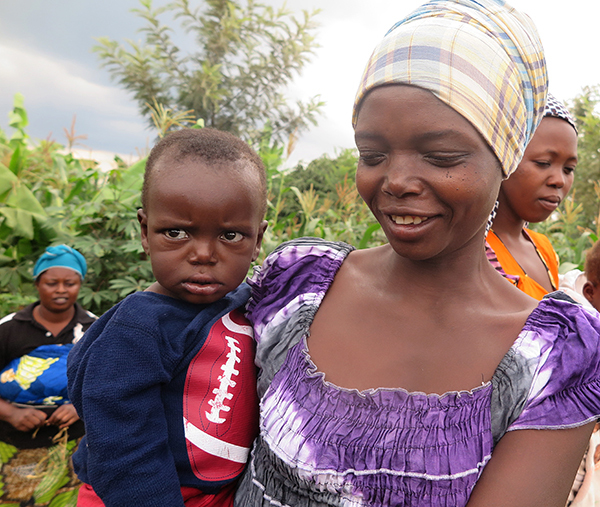 But after Nyirahabimana learned more about the program, she started attending to see if her baby could get healthy. A few months later, she was surprised by the results. Parents who participate in the Gikuriro are happy and proud to be able to prepare healthy food using their own means. They are confident that their family members are no longer at risk of malnutrition because of what they’ve learned about creating balanced diets. In Rwanda, 38% of children under age 5 suffered malnutrition or stunting in 2015, according to Rwanda Demographic and Health Surveys 2014-2015. Severe malnutrition or wasting—low weight for height—was at 2%, while 9% of children were underweight. The Gikuriro program also focuses on helping the local government and CRS’ local partner organizations become stronger. It supports Rwanda’s Community-Based Food and Nutrition Policy in five districts and Community-Based Environmental Health Program Promotion in eight districts of the country. In the district of Nyarugenge, where Keza lives, the program is being implemented by the Women Investment Fund, a local nonprofit that promotes and improves the social and economic welfare of rural women and children. The 5-year Gikuriro program is funded by the U.S. Agency for International Development. It began in 2015, and integrates nutrition, water, sanitation and hygiene activities to improve nutrition for women and children younger than age 5. CRS implements the program along with The Netherlands Development Organization.